Our faces aren’t a “one-solution-solves-all” type of canvas. How is it that we can have dull skin and fine lines at the same time? It may not seem fair, but it’s common for different areas of the face to require their own treatment for achieving complexion perfection. That’s why selfie-obsessed influencers are increasingly following in the footsteps of skin therapists, custom-tailoring treatments by multi-masking (a.k.a. wearing more than one mask simultaneously) to solve a variety of complexion dilemmas at once. You need to treat your face like your wardrobe: mix and match until you find an ensemble that works for you! Here, we’ve mapped out five ways to lay one on—and then another—to achieve an even, smooth glow from hairline to jawline and everywhere in between. 1. Exfoliate Before You Start. When it comes to application, think of your face as a map and choose one to three formulas to address each borough. For oily areas, charcoal, clay and mud draw out impurities in the t-zone, where sebaceous glands are most prominent. If blackheads are a bother, use a peel-off mask to lift dirt from congested pores. Discolouration? A brightening mask containing vitamin C or licorice targets areas where the sun hits most, like the tops of cheekbones. 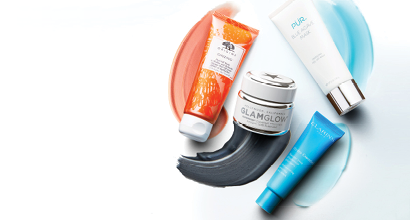 Give dry patches a kick of moisture with hyaluronic acid-loaded masks. And to treat fine lines, reach for serum-soaked sheet or cream masks rich in retinol. 3. Bring On The Tools. 4. Give Your Eyes A Surprise. 5. Yes, You Can Layer Your Masks.